You just finished your annual checkup at the dentist where you discovered you have a severe Bruxism problem and your teeth might be in jeopardy. Huh? What does that mean and should you really be concerned? The medical term “Bruxism” is generally categorized as a sleep disorder best described in laymen’s terms as excessive teeth grinding or clenching during sleep. While bruxism often occurs during sleep (sleep bruxism), it can also happen during the day (awake bruxism), although it’s usually not as pronounced during the day because the bruxist (teeth grinder) is awake and has semi-conscious control over the condition. Nonetheless, bruxism affects nearly 40 million people in the United States and can cause irreversible damage to the teeth as well as a host of other health problems if the symptoms are not properly treated. What are the Symptoms of Bruxism (Teeth Grinding)? Abnormal teeth wear can be a sign to the dentist that bruxism might be a problem. Unless there is pain accompanied by excessive wear, many people don’t notice minimal wear that takes place over a long period of time. Often, a dentist is the first person to take notice. Temporomandibular Joint Syndrome or TMJ, is pain associated with the temporomandibular joint that connects the skull and jaw. Teeth grinding is a popular culprit for TMJ although it can also be caused by an injury to the jaw, misalignment, or stress. Even chewing gum can cause TMJ for some people. Waking up with a headache on a regular basis is sometimes caused by teeth grinding at night during sleep. The exact cause could be from various sources, but headaches accompanied by teeth pain or wear is reason to be believe bruxism might be the cause. Like with headaches, bruxism causes pain in the muscles around the neck and jaw. Because the ears are in close proximity to the source, some people experience earaches in addition to other pain. Intense grinding or clenching might be the cause of soreness in the teeth and gums from prolonged pressure put on the teeth. 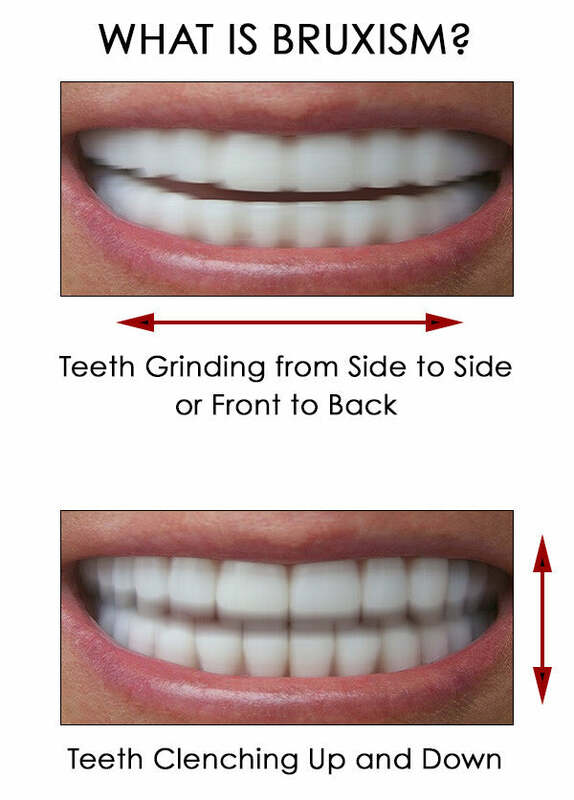 The grinding isn’t directly on the gums but the is transferred through the teeth to the gums. Bruxism is considered a sleep disorder and sometimes causes problems with getting restful sleep. Other sleep disorders such as snoring or sleep apnea can influence whether a person grinds their teeth while they sleep, and the combination of multiple disorders can certainly impact a lack of quality sleep. Teeth grinding and clenching sometimes begins as a reaction to stress or anxiety and continues until it becomes a regular habit that escalates at night during sleep. Daily stress and anxiety are near the top of list of reasons people grind their teeth at night. They can cause grinding during the day too, but it becomes more pronounced at night. Most people don’t know they snore or have sleep apnea unless a spouse or partner tells them about it. It’s unclear whether snoring or sleep apnea can cause teeth grinding but they frequently happen together so there might be a correlation. Drinking beverages loaded with caffeine late in the day or early evening makes it difficult to sleep and increases muscle activity, hence grinding or clenching while sleeping. A twin cohort study found that both men and women who experienced bruxism were over two times more likely to be heavy smokers than non-bruxists. Most people probably won’t notice any change in sleep patterns from an occasional glass of wine at night, although regularly drinking several drinks in the evening can increase hyperactive muscle movement and poor sleep leading to bruxism. Certain mood disorder medications like antidepressants and SSRIs have been known to increase the symptoms of bruxism during sleep. Parkinson’s is a neurodegenerative disease causing tremors and involuntary shaking particularly at rest that might play a role in teeth grinding or clenching. One of the most popular methods for treating bruxism is with the use of an occlusal splint – bite guard or teeth grinding night guard – worn on the teeth during sleep. These devices come in many shapes and sizes and are often recommended and fitted at the dentist. While these types of mouth guards might not directly prevent grinding or clenching, they will certainly save the teeth from undue wear. Over time, many users report wearing a night guard actually helped reduce nightly bruxism. Cognitive behavioral techniques to reduce stress and anxiety are great at getting to the root problem and can help prevent bruxism. Other relaxation techniques like meditation, focused breathing, aromatherapy, or taking a warm bath before bed can ease tension and stress and improve sleep while reducing bruxism. Recent dental work such as a crown that is too high can cause an abnormal alignment and bite that is noticeable and creates an irritation. This can be easily adjusted by the dentist and should solve the problem. If you suffer from any of the symptoms of pain mentioned above, you might have a teeth grinding problem and should discuss it with your dentist. 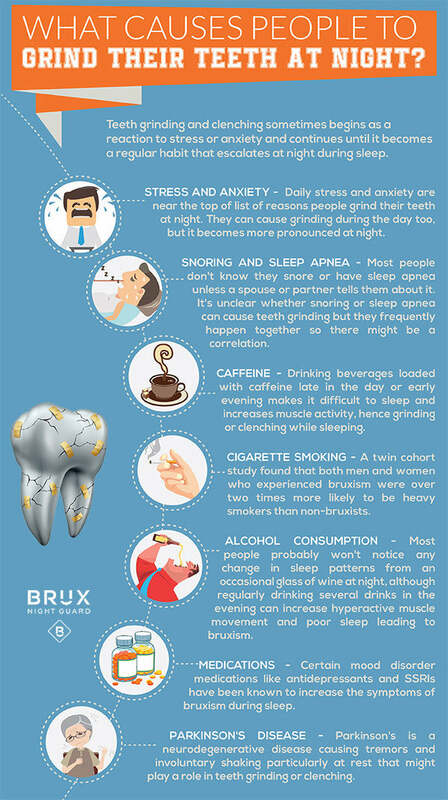 Some of the symptoms of bruxism can be reduced by simple lifestyle changes such as relaxing before bed or not drinking caffeine late in the day. It’s important to protect the teeth by using a bite guard at night or possibly during the day if stress is a problem. Saving and protecting the teeth can reduce other more severe issues later in life. Do you Grind your Teeth? Click here and let us know by taking a quick Survey.